In recent years, technological advances have resulted in the rapid development of a new exciting research direction --- the interdisciplinary use of sensors for data collection, systems analysis, and monitoring. Application areas include environmental monitoring, military surveillance, computational neuroscience, seismic detection, and many more. Among the research areas considered, sensor networks represent a very active area, as well as work on problems such as sensor networks, sensor network localization, and network design. They are also related to optimization problems that have multiple applications and require interdisciplinary techniques from several fields. Additionally, neuroscientists use sensors to collect data during tests which record brain activity. These highly calibrated sensors require precision engineering techniques play an important role in analyzing and integrating large datasets. 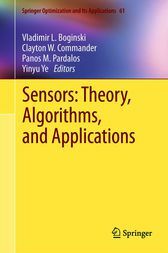 The purpose of this book is to bring together recent developments of both theoreticians and practitioners representing various fields from engineering, computer science, biomedicine, and the military, share knowledge, ideas, and techniques regarding the state-of-the-art sensor research.